I recently had the opportunity to observe several teacher coaching pairs as they made their initial foray into peer coaching after a single day workshop with me where they were introduced to the concepts and skills of peer coaching. In the workshop I was able to model a pre-conference with a participant and then had the teachers pair and conduct pre-conferences for an upcoming lesson that the colleague could observe. In my coaching training and modeling I stress coaches using open questions and paraphrases to create a dialogue in pre-conferences where the teacher is in charge and guiding the direction of the observation and coaching. I stress how these questions differ from evaluation pre-conferences where evaluators are getting information they need to do the evaluation. The coach is following the teacher’s thinking so that the coach’s job becomes defined. As a coach I want to understand “what the teacher is thinking” about the learning activity that I am going to observe. I want to hear and see the lesson through the teacher’s eyes as well as through mine. As a coach I’d like to take off my agenda before I enter the classroom and put on the teacher’s. My humanness prevents that so I work to become conscious of the teacher’s agenda. I had the opportunity to observe the initial post conferences of some brave participants who jumped right into learning and practicing the day after my training. 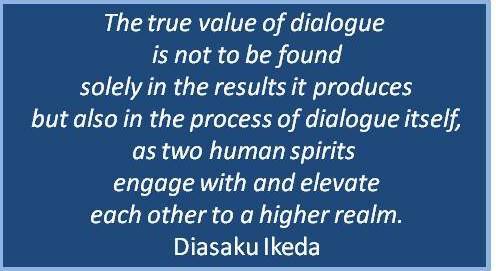 As I reflected on their experiences I identified two components that can increase the dialogue in post conferences. The first item is actually created during the observation. When the observer records some of the actual words of the teacher and students and observable students’ behaviors they are prepared to share these in the post conference and spark conversation. One teacher wanted the coach to focus on the “help” that she provided students. Her coach had noted each time that she helped students with a check next to the student’s name. With a quick look at the observer’s notes the teacher could decide her comfort with the equity of her assistance and the amount of feedback she felt appropriate for developing the student independence she wanted. The conversation can grow deeper when the coach can add examples of teacher’s responses next to student’s names. As a coach shares these comments, the teacher begins talking and reflecting on what the thinking was behind her responses or the teacher’s reflection raises a consciousness about wanting to respond differently. The post conference now feels more like a collegial conversation than a report (evaluation). The second item involves the coach asking open-ended questions in the post-conference that uncover the teacher’s observations, before the coach shares her observations. In the case of the example above, where the teacher is interested in the help she provides students, the coach might begin with, “Talk about some of the conscious decisions regarding ‘helping’ that you made during this lesson.” As the teacher shares her recollections, the coach can reinforce those he noted and add others that he recorded. In another example a teacher was interested in having the coach observe the level of comfort that a student had in being a participant in the lesson. Here the coach might begin with, “What did you notice about Caroline’s participation? How would you describe her level of comfort? How does what you noticed compare to what you expected?” How does it compare to what you want?” As the teacher shares her thinking on each of these questions, the coach has the opportunity to connect specific observations, thoughts, and ideas….even a suggestion. All of which fit into the conversation. Dialogue and conversation will likely gain greater teacher vulnerability and reflection then reporting. Vulnerability and reflection will produce teacher growth.